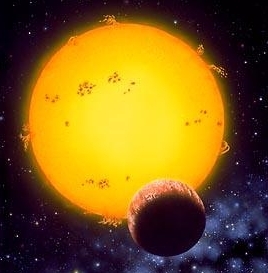 Home » Science/Tech » Planet Found Orbiting 2 Suns! As crazy as this may sound, it is in fact true. Astronomers in California have found a planet that is orbiting 2 suns. Astronomers say a bit of science fiction is now reality. They’ve spotted a planet orbiting two suns. The discovery was made by NASA’s planet-hunting telescope Kepler. Scientists describe the find in Friday’s issue of the journal Science. They are calling the new planet Tatooine after the fictional body in the “Star Wars” films that boasts a double sunset. The alien world, about the size of Saturn, is frigid and inhospitable. It orbits two stars 200 light-years from Earth. Though there have been past hints of the existence of other planets that circled double stars, scientists said this is the first confirmation. Kepler was launched in 2009 to find out how common other planets — especially Earth-like planets — are in the universe. Black Hole might have wiped Alien life! Next: Miss Universe 2011 Leila Lopes faked Documents?